Home » Business & Marketing » Which Industry Pays the Highest Data Analyst Salary? 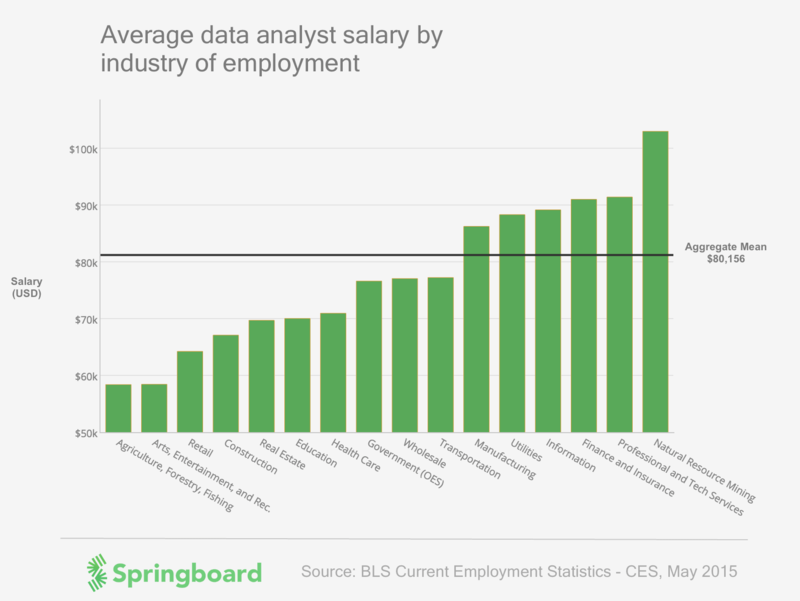 Springboard analyzed employment salary data for 1.5 million data analysts to find out which industry pays the highest data analyst salary, and who hires the most data analysts. Working as a data analyst is a popular choice for many. An entry-level data analyst will receive an annual salary between $50,000 – $75,000 while experienced analysts can expect to receive between $65,000 – $110,000. A data analyst salary is well above the median household salary in the U.S. of $51,939. You might expect something like $60,000 for an entry-level data analyst salary, and something like $90,000 for a senior data analyst salary. Read more about analyst roles and responsibilities here. Still, $50,000 – $110,000 is a very broad data analyst salary range. What factors push a data analyst salary over $100,000 a year versus earning only $65,000 a year? The difference within that range can mean the difference between paying off a house in 10 or 20 years. We also wrote about data scientist salaries here. 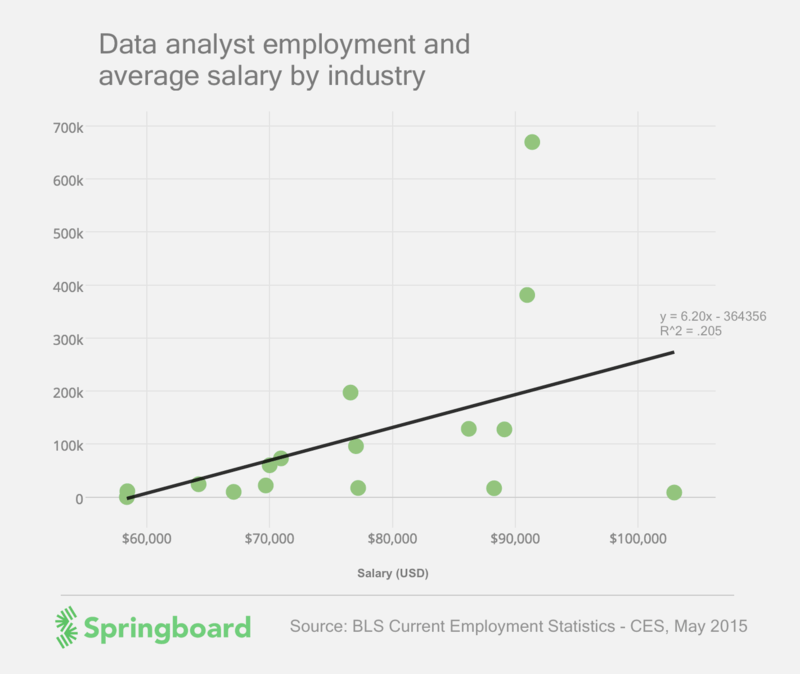 Springboard examined average salaries for data analysts across different industries. What we found indicated a big difference in the quantity of data analysts hired and the data analyst salaries paid for each industry. Our analysis used annual salary data from the Bureau of Labor Statistics, combining salary and employment data for over 1,500,000 data analysts across the country from 2015. What we found is a vast difference between the average salary of data analysts in different industries. Working in one of the worst-paid industries means an opportunity cost up to $40,000 a year. Over a 30-year career, a data analyst in the wrong industry will have earned well over a million dollars less than data analysts working in a better paying industry. Related: Data Analyst vs. Data Scientist: Who Earns (and Does) What? So which industries are the ones where data analysts stand to gain, and which are the ones where data analysts should look for higher compensation? The mining industry pays data analysts the highest average salary of $102,946 per year. This isn’t all that surprising – petroleum and natural gas producers lose an estimated 22 percent of their potential annual revenue due to data inefficiencies, the highest amongst all industries. According to a survey of national and multinational oil producers, “Approximately 89 percent noted that leveraging more analytics capabilities would add more business value.” Another reason it pays to be in the mining industry – international demand for mined resources is at an all-time high, driven by construction booms in developing industrial countries like China. If you’re looking for a higher data analyst salary, search for a position in technology or finance. 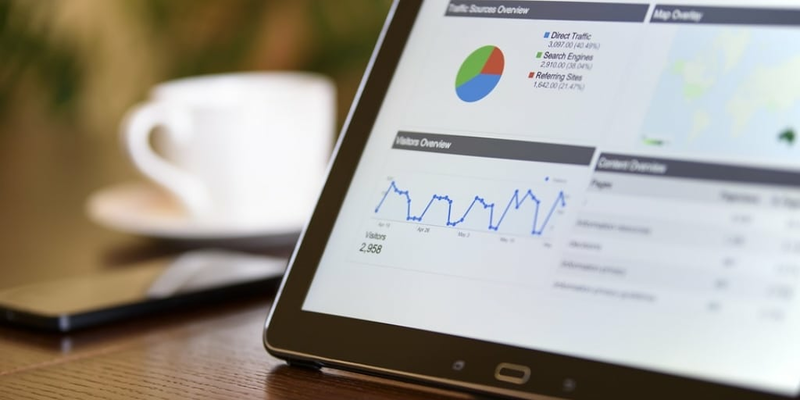 Top businesses in these industries have enormous automated databases of user-generated and market information so a trained analyst has immediate value. On average, data analysts in the tech, finance, or natural resource mining industries earn over $30,000 more than data analysts in agriculture, and they earn $15,000 more than data analysts in education or healthcare. Although there is a large amount of innovation in agricultural analytics, the leaders in creating data solutions for farmers, Monsanto and DuPont, are classified by the BLS as manufacturers so some of the numbers for the certain sectors may be misleading at face value — keep that in mind when you look at the chart. Working for industries that pay their data analysts well is certainly appealing, but will you be able to find employment that offers the highest data analyst salary? We broke down employment figures to find out which industries hire the the highest number of data analysts, and to find out which industry a data analyst is most likely to work for. We found that the industry with the most number of data analysts employed (136,020) is the professional, scientific, and technical services (PSTS) industry – a group of professions that includes engineering, computer systems design, consulting, and research and development firms – and many companies within this industry sell specialized platforms for commercial use. Because this industry represents a broad spectrum of different professions, it has inflated employment numbers compared to other industries listed by the BLS. Worth noting is that the mining industry, which pays its data analysts the highest average salary amongst industries, employs the second lowest number of data analysts (8,620). It may pay well to work in data mining, but there aren’t many open positions if you’re searching for a new job. If your goal is simply to find employment as an analyst, the government or financial markets are not a bad place to start. The financial industry in particular offers many positions and above-average salaries. We performed a linear regression on average salary and total employment for each industry to see if there is a relationship between the number of data analysts an industry employs, and how well those analysts are compensated. We wanted to see if demand for data analysts was driven by industry-specific factors or if it was driven by price sensitivity (i.e did demand for data analysts decrease when higher salaries were offered, or was demand for data analysts independent of the salary offered?) We found that higher employment numbers in an industry are correlated with higher salary, although the residual error can be large. After removing outlier industries, the regression results had nearly twice goodness of fit (R2 =0.395) and had 98% statistical significance. With a slightly strong positive trend in correlation between salaries and the amount of employment in an industry, one can doubt the theory that demand for data analysts is dependent on the going market rate for them. Perhaps a more plausible explanation for the variability between what different industries pay is that some industries simply have more demands for analysts because they have figured out how to extract more value from their data. 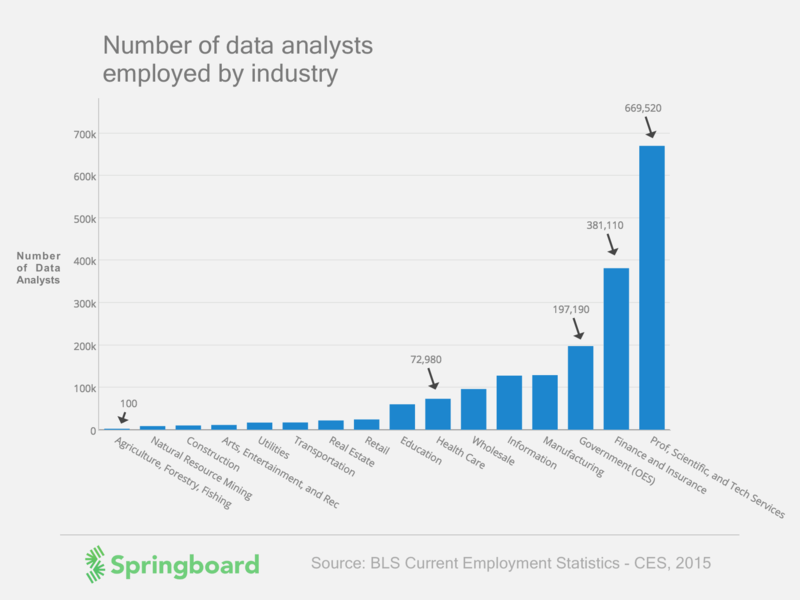 Data analyst salaries have a wide range ($50,000 – $110,000), but by breaking down the data analyst salary by industry, one can see different industries paying vastly different amounts for analysts. The data analyst salary offered doesn’t seem to be sensitive to higher wage costs. There seem to be industry-specific pay ranges, perhaps explained by the ability for certain industries to get more value out of their data. The professional, scientific, technical services industry and the financial services industry employ nearly half of all data analysts, but analysts can find well-paying jobs just about anywhere. Below we’ve included a list of the top-earning companies for industries that pay an above-average data analyst salary. Use it to find which companies are paying their data analysts well, and to help begin your search for data analyst positions at an established company. Data analysts working in the natural resources section should expect salaries above $100,000. There are not many data analysts in the field however. Data analysts working in professional, scientific, and technical services can expect to earn $90,000 on average. Most data analysts work in this field. Financial data analyst salaries average around $90,000, and there are almost 400,000 financial data analysts. Technology data analysts can expect to earn a salary slightly below $90,000. There are slightly more than 100,000 in the industry. Utility data analysts can expect to earn about $90,000. There are not many data analysts in the field however. Manufacturing data analysts earn about $85,000. Over 100,000 data analysts work in the field. PS: Since this is a popular query among our students, we also want to highlight that a health data analyst salary would average slightly over $70,000–coincidentally close to the 73,000 or so health data analysts. Check out this post to learn more about how data science is being used in healthcare!